Dream League 11 is the 3rd major for the season. With only 2 more majors to follow, a good performance here could secure a top 12 finish on the Dota Pro Circuit (DPC) table. Because the distribution of DPC points is so top heavy, a 3rd place finish at DreamLeague would be able to push a team with no points up to 5th on the rankings. With TI being the most lucrative tournament, not only in Dota2 but the whole of Esports, teams are absolute in their practice and performance at majors. DreamLeague, just like the other majors, offers a $1,000,000 prize pool along with 15000 DPC points. The physical location for the event is at a small-ish venue, Annexet, located in Stockholm Sweden. It will be played on 7.21c, making it the 3rd international tournament played on this patch. Group stage starts at 23:30 AEST on the 14th of March, finishing on the 16th of March AEST. The teams have been placed into groups of 4, where they play GSL double elimination to determine who’s advancing to the upper and lower brackets. Playoffs start at 23:30 AEST on the 16th of March, finishing on the 25th of March AEST. The lower bracket teams play round 1 Bo1’s, before the remaining teams play a double elimination format. All games are Bo3 apart for the Grand final (Bo5) and the lower bracket round 1 (Bo1). The seeding for DreamLeague has been done mainly based on DPC points. The problem with this is that teams tend to change a lot. Whether it be roster changes or a failure to adapt, valuing a team based on performances up to 5 months ago tends to lead to unequal groups. Groups A and B have 3 strong teams, whereas groups C and D are at the mercy of VP and EG respectively. Contains two tier 1 teams, with the North American silver medallist, J.Storm. It’s going to be a blood bath with Keen Gaming also coming off a strong performance in WESG. The presence of both Secret and Liquid should guarantee that J.Storm and Keen enter the lower bracket. Before LGD’s roster change, I would have had them as the group B leader. With their present performance being uncertain, Fnatic are probably the favourites. I can’t see Infamous taking enough games off of these 2 teams, and NiP have looked far too inconsistent to place in this group. I expect Fnatic and LGD to take the upper spots. This is bear country and VP are the apex predator here. The roster issues that have been plauging Ehome have caused them to lose the magic that made them so dangerous. Mineski and Forward gaming are not anywhere close to the level of VP. What will be interesting however, is who will take out the second upper bracket seed with my money on Forward Gaming. 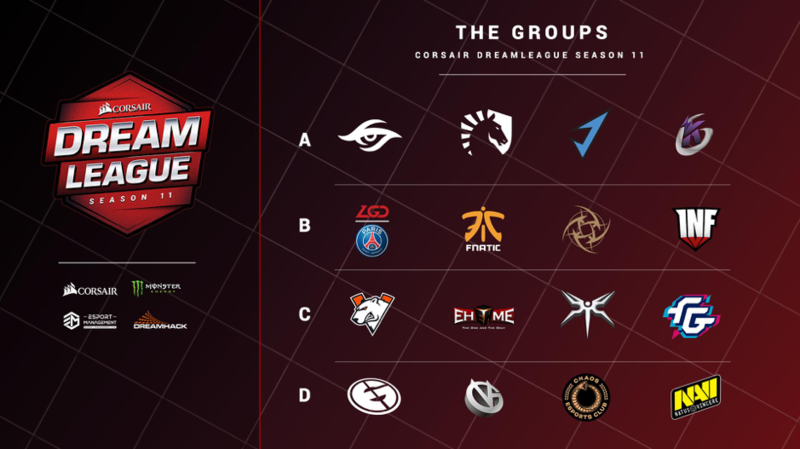 Probably the weakest group and EG should have no trouble dominating the entire group. There is also no clear-cut teams to take second place in this group. The only interesting games in this group will be between VG, Chaos, and Navi in an attempt to reach the upper brackets. Personally, I think VG is currently the strongest with better past performances than the other teams, but comparatively weaker recent results. While these tier rankings look at past performance and general expectations, remember that teams have varying match ups against each other. The interdependence of teams always adds a splash of volatility. Undisputed champions of the current season. Reading the current patches perfectly, backed by phenomenal play. 1st place at the Chongqing Major, 1st place at ESL one Katowice, 2nd place at the Kuala Lumpur Major. Have had a great back and forth with Secret so far in the season, looking just as strong at times. Have enough DPC to qualify for TI and as we saw in their group performance in MDL Macau, this may limit their effort in the major. 1st at the Kuala Lumpur Major, 2nd at the Chongqing major, 3rd at MDL Macau. The long standing North American tier 1 giants. So far this season, have lacked the ability to beat VP or Secret, making them unable to take a higher placement in the majors. 2nd place MDL Macau, 3rd at Chongqing major, 3rd at Kuala Lumpur Major, 3rd at The International 8. Have had a weird season so far, not competing in the 1st major and playing with a stand-in for the 2nd. Liquid have still looked like a tier 1 team, they just haven’t had any of the results you’d expect. Surprisingly are 10th on the DPC ladder, giving them a hunger coming into the tournament. 1st place at MDL Macau 2019. Fnatic currently dominate their local region and have had some strong international showings at past events. Strong individual play and coming from a region that often has its own meta, Fantic has the ability to surprise stronger teams and dominate weaker ones. A very dangerous team even to tier 1 teams. China’s ex tier 1 team. They have recently lost their Midlander 'Maybe', who is considered one of the best in the world. He’s being replaced by 'Xm', a player I’ve never seen. Whether LGD will be able to perform with their changes is unknown, but the question remains; does China still have a tier 1 team? 2nd at The International 8, 4th at the Chongqing major. Somewhat inconsistent performances against lesser teams. Have had a disappointing season, despite possessing some great European talent. 'PPD' hasn’t been able to work the same magic we saw from optic. They’ve looked like a strong team, until they don’t. Possessing some incredible players including The International 5 winner 'Universe'. Have had some great performances under the name VGF.storm at the beginning of 2018. Have recently looked weak struggling at both past majors and not posting any results of significance. The old Pain Gaming roster. Made appearances at both majors, struggling to perform consistently. They play exciting Dota that can surprise teams if they’re not ready for it. Minor winners after bombing out of the China qualifiers. The 2nd best Chinese team at the tournament. Played in both past majors, able to compete with tier 2 teams. Obtained an 8th place finish at both past majors, and at TI8. One of the biggest names in Dota 2, a relic of a different time. Not sure if they’re going to be able to consistently compete with the international teams. Weak results so far in their region for a team going to a major. Have had some good results against the rough and tumble CIS region to qualify for this major. Looked strong at the beginning of the season, even against some tier 1 teams. They’ve lost 'EGO' and 'Faith' and have really struggled to put together a decent performance ever since. 5th at the Chongqing major. Started the season with some very disappointing results, struggling to qualify to anything significant. Thankfully have posted some good recent performances in their region, that can hopefully be converted into international success. Home to Australian player 'Kpii'. Haven’t really performed against any of the global powers. Have had good results recently in local competitions. Managed a 2nd place finish at WESG. They got blitzed at both the past two majors they attended. Haven’t really played any local competitions yet and have struggled to make any sort of international impact. Looking at their performance, it raises concerns over the amount of NA qualifying spots. No real expectations for this team. Have had roster changes since their qualification to the major and have yet to play a game. Have been a strong player in their scene, but nothing to suggest they’ll be able to compete internationally.